To provide dependable and reliable Laundry-Dryclean services to the clients. To meet personalized laundry–dryclean service demand of the clients with affordable price, reach the doorstep of prospective clients, procure latest equipment and adopt new methods & technologies to retain clients, ensure sustainable and significant growth of productivity and sales. 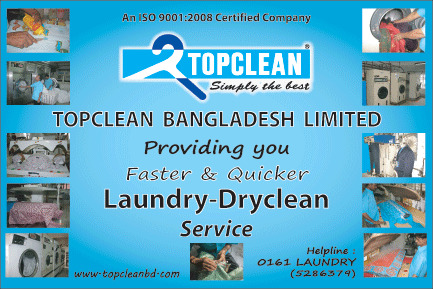 TOPCLEAN Bangladesh Limited started its’ commercial operation on 20th May 1998 as a Singapore-Bangladesh Joint Venture Company, incorporated in Bangladesh. It became fully Bangladeshi Share Holders owned Company in 2005. The plant was located at 271 Tejgaon Industrial Area, Dhaka-1208. 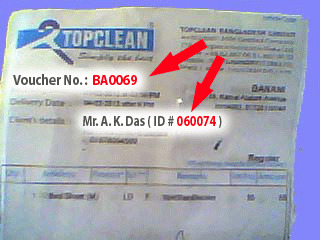 In 2007, TOPCLEAN was shifted to it’s own premises at 27 (East), Tejgaon Industrial Area, Dhaka-1208. We have the ability and capacity to support the service for Shops and Institutional Clients. Our plant strategically located to be a maximum of one hour driving distance from shops and institutional clients. Our policy is to operate the plant for a maximum of 16 hours per day, thus leaving 8 hours spare for contingency. Managed by a team of laundry professional with more than 35 years of experience, you can be assured of dependable and quality services on time and every time. We have a multi disciplined highly experienced management team in plant and at corporate level providing depth in leadership thus ensuring continuity of plant management wherever and whenever required. Planned Preventative Maintenance is done by own engineers and sometimes with second party service agreements. Topclean has its own dedicated engineering resource at plant site as well as full access to industry recognized engineering support providers. Our plant has the facility of 250 kva diesel generator to ensure uninterrupted service if the main power fails. We have three boilers, two 500 kgs and one 1500 kgs. The capacity of the boilers is just double than our requirements. We have installed standby boiler to meet the emergency need of the clients. In addition to this we have an agreement with MEL who will supply two 500 kgs boilers to support our production process in case of sudden breakdown of our existing boilers. Naturally water is our key raw material that we get from our deep tube well. For emergency we also have the facility to use WASA water. We have WTP to purify the WASA water to supply clean water for laundry process. We have a formal agreement with our fellow laundry-drycleaning company to process and supply linen/garments in the case of failure/disruptions of services in our plant. We have 5 vehicles ranging from microbus to cover van. If we have a breakdown we can put an alternative vehicle on the road typically within 8 hours and maximum of 24 hours. All routes, collection/delivery points and onsite instructions are fully documented to enable driver flexibility. Topclean utilizes its own relief drivers to mitigate the use of third party distribution. Our IT centre is operated in a manner that ensures 24x7 availability of our computer system. Our key server machine is mirrored so that failure of one machine will not cause any break in service. We back up everything to two locations (one onsite for fast restore, one offsite for disaster recovery). Topclean has acquired latest plant equipment of renowned brand mainly from Germany, France, Belgium and USA. Most of the equipments are of industrial type in term of production capacity and product quality. In the event of failure or breakdown of any equipment Topclean is in a position to maintain continuity of service because of sufficient standby equipments. Since inception, Topclean has been using imported laundry chemicals in order to ensure quality services. Our Laundry chemicals are from Klenco (Singapore) Pte. Ltd., spotting agents from Wilson (U.S.A), Drycleaning solvent Perklone-D from Samuel Banner & Company Limited. (UK). All these chemicals are biodegradable in compliance with environmental requirements. We have arrangements with our laundry chemical supplier, M/S. Klenco (Singapore) Pte. Ltd., to visit us at least twice a year to check, monitor and ensure proper usage of chemicals that help us to improve our quality as well as to maintain standard hygienic conditions in our plant.